Update 01/16: Housing decay will be reactivated in TOMORROW. Update 01/11: Housing decay will be back on in SIX DAYS. Since Monday, January 16 is a holiday in the US (Martin Luther King Day) have decided to extend the grace period by another day. Housing decay on will be re-activated on Tuesday, January 17. Please note that even if your account has been inactive for more than 90 days, you still have 5 days after housing decay is back, before your house is gone. We will turn on housing decay on Monday, January 16. Please take the necessary steps to secure your house before its turned back on. If want to log in but you haven’t had the chance to link your account in the Account Center yet, please check the Account Center Management Page guide and the How to link my Accounts guide. You can always contact ‘support@ultimaonline.com’ if you encounter a problem. The 15th birthday of Ultima Online is approaching in 2012. MMORPG.com started the year doing a short interview with UO Associate Producer Bonnie “Mesanna” Armstrong. Ultima Online has been on the market for almost 15 years, can you tell us why you think it has such longevity? 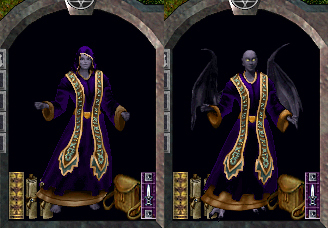 Ultima Online is the ultimate Sandbox. We have something for everyone from designing your house from the foundation up to slaying dragons. We are probably the only game on the market that you can still run on a low end computer, in addition to the personal one on one interaction with the players that has forged an amazing community. I personally have played UO since 1997 and worked on it since 1999 and I continue to learn or see something new and entertaining every day. Follow the link to read the complete interview. As promised, the site dedicated to the long and storied heritage of Ultima, www.ultimaforever.com, has been updated today. Make sure to have a look through the history pages, and don’t forget to download and play the full, original PC version of Ultima IV from our friends at Good Old Games. The crowds are gathered for the spectacle called the Britannian Summer Games. This year’s sponsors of the games is Serpent Cross Frozen Tavern Treats, all your 80 proof favorites on a stick to beat the summer heat. Athletes are present from all eight major cities along with participants from the Royal City in Ter Mur, so we expect some fine competition this year. The event took off with a bit of an upset, when the torch runner disappeared en route and was never seen again. The torch however did show up on a Luna vendor priced at 50 million gold. Despite the delay, the fans are very geared up this year. Vas Mag-Dig of the Royal City took the gold at thumb wrestling; a real spoiler for the gargoyle haters out there, and there’s sure to be some agitation amongst the fans when the time comes for the jumping events. In the corral potion toss, Lady Lagfest of Minoc scored a gold with a record 12 sheep taken out by a single purple potion; a top record to be sure. The Boozeball event is being postponed until later in the games due to players suffering extreme dehydration during the practice sessions. The red-baiting event was recently concluded with Duke Sandwichpress of Yew drawing in 8 murderers to the Felucca Yew moongate with 7 successful guardwacks. This is some of the best taunting seen in this event. The competition was unable to ramp up their atagonizing to draw in the fence-sitters, and Sandwichpress takes the gold. Sofandra of Moonglow received a postumous silver for her effort, with Neb of Jhelom trailing with a bronze. Tragedy struck Saturday, when flames erupted from the Museum of the Macabre during its grand opening to the public. Patrons were escorted to safety as bucket brigades battled the conflagration to no avail. Those loyal to the museum’s curator, managed to to rescue all but a decorative cabinet from the burning structure. Investigators are questioning witnesses on an alleged individual fleeing the scene of the event. The big man shifted uncomfortably in his saddle, leaned left again and fixed me with his steely eyes. “I can show you proof,” he said. Town Drunk looked around carefully. Then he dismounted and mooned me. OMG! His left buttock is missing! Today marks a triumphant day for an unsung hero whose name was finally vindicated and came about as a result of some very unusual circumstances. While browsing an antiquities shop, Thomas Brower discovered a carved figurine in uniform that strongly resembled himself. What followed, was a personal quest that would eventually clear his father’s name. Thomas’ father, Marcus Brower had long suffered the stigma of having been named a deserter in the war against Minax’s forces and he and his family would endure the slurs of the locals, calling him a coward and a traitor. Sadly, Marcus claimed that he could not recall what happened in those days, and those facts would remain shrouded in mystery until the discovery of the figurine. The carving was that of his own father, Thomas had learned from the shop owner, as well as the name of artist who had created it. Thomas then travelled to meet with the artist, who was a survivor of the massacre at Paws. When the artist discovered with whom he was speaking, he promised to make a concerted effort to locate other survivors, so that the story could be told. And what a story it was. When Corporal Brower arrived at Paws 35 years prior, he was a scout sent on a mission to report back enemy troop numbers and armament. Slipping past enemy patrols and guards, he came upon a hamlet with survivors numbering no more that 30, as Minax’s troops systematically eliminated anyone deemed a possible threat. The remainder were those with no martial training; tailors, cooks, artists, etc. It was those individuals that he would secretly rally to use their own knowledge and talents to deliver a crushing blow against the town’s occupiers and avenge the deaths of the slaughtered villagers. Enemy forces in Paws were gathering as a spearhead against Trinsic. In the time that he remained concealed in the village, Brower was able to coordinate several acts of covert sabotage. Working with the miller, they let slip a concealed location cache of deliberately tainted grain, which the enemy forces were willing to utilize for their own rations. With the assistance of a local artist, Brower had maps drawn to replace the ones the enemy would be using to coordinate the attack against Trinsic. Heavy seige equipment and calvary would be bogged down in swamps not appearing on the new maps. Travel routes would pass through lizardmen encampments. When the spearhead was launched a smaller retinue remained behind as a safety measure. Brower’s luck did not hold out as he was captured following an inspection of the village, resulting in a brutal interrogation that rendered him comatose. Inspired by Brower’s example, the village tailor fabricated two uniforms closely modeling the ones worn by the occupying forces. Two volunteers donned the uniforms and attempted to carry the injured scout to a safe location, but were unable to carry him past enemy lines, due to guards posted around the perimeter of town. The town’s coffinmaker proposed the unique solution of placing Brower’s unconscious body in a coffin, and conspicuously carrying the coffin for burial outside the town limits. However, guards insisted upon accompanying the burial party, and Marcus Brower was buried and remained so for 2 days, when two villagers slipped past the posted guards in the night and were able to disinter him. The two faithfully delivered their charge to a nearby hermitage, where he was presumed to have been treated for his injuries. The two men returned from their errand back to the village so as not to arouse suspicion. Soon afterwards, the spearhead failed, the war ended, and the people of Paws often wondered whatever happened to the hero who came to their village. Brownie workers are in custody after a string of incidents following their departure from their previous employment with a popular footwear firm. By a consensus, the idle band decided to try their hand at an entirely new business enterprise, when Yew foresters discovered the group attempting to haul an oven into a yew tree, which had been conveniently carved out for the purposes of establishing a cookie factory. The brownies asserted that they attempted to go through proper channels but were thwarted at every turn. However, town locals countered that the devious group made every attempt to circumvent proper procedure, even going so far as listing their business as “elven run” to curry favor with Heartwood denizens. Nana the sweet at the Jolly Baker pointed at a framed scroll on wall of her bakery as she stated. “This is a charter from Lord British, himself, for this establishment to serve as Yew’s provisioner of baked goods, and we meet the needs of this town quite adequately without having to jockey against a bunch of foreigners, thank you very much.” Eric Flamell, a resident woodsman had been cutting firewood, when he confronted the brownies during a previous attempt to gut out one of the ancient, giant yews. The woodcutter who was livid, expressed concern that their reckless activities might compromise a key support keeping Heartwood aloft, resulting in unecessary elven casualties; threatening to report them to the foresters if they persisted. But the warning went unheeded, and they moved on to yet another location to pursue their obsession. In the aftermath, foresters felt that a horrible tragedy had been adverted with ovens, trees, and feckless feys making a sure recipe for disaster. Legal counsel has prepared an amnesty deal for the brownie group, provided that they never return to the region. The chief spokesman for the brownie group seemed affable to the deal and is looking at future prospects of converting ore carts into concession stands for the hungry lunch crowds in the mining town of Minoc. To some they can be more annoying than those who insist upon sparring with thier horses or cats at the public bank. They are notorious for slipping out of the hidden, dark places, waylaying adventurers and stealing foodstuffs from backpacks. Roaming in packs as numerous as ratmen, they are seldom ever seen, but the gremlins are scattered throughout the lands causing all sorts of mischief. Very few notice the shenanigans that they have committed over the years unless you count the incident where the gremlins stripped the grapes from the arbors; much to the chagrin of the monks. To this day, the Yew winery still contains a magical chest to protect the plants and keep the gremlins at bay. One of the latest deviltries, for which they are said to be responsible is sneaking around at night and vexing cartographers by replacing the treasure maps that had been already decoded with new ones. So clever are they at concealing themselves, many insist that they are just a myth. But, more than one argument has erupted between close allies as a result of some item either planted or deliberately misplaced for the gremlin’s personal entertainment. These pests have been lurking around since the dawn of time and will probably continue to forever plague mankind with their hijinks. So, be wary even in the safety of your homes when it comes to these tiny terrors. On behalf of Clan Chitter, we’d like to thank Tammy Knockers and Eugene for allowing us to be part of your special day by sending us all of that wedding cake. Very rarely are we sent anything of value from the upper world, (bulk order deeds mainly) so you can imagine how flattered we were to receive such wonderous treats. Why not consumate your marriage in a honeymoon suite which we would be happy to provide? We wish to offer a complimentary set of prospector tools as a small token of our appreciation. Again, Tammy and Eugene, congratulations and may your first litter be a healthy one. The pages of the Yew Times is twice as absorbant as the competitor’s. One page is enough to wrap an entire sea bass, and one issue will last me an entire week of sales. The Yew Times is wonderful. Not only do I start off my morning with it, but it it keeps a body warm at night. Not only is the rune beetle a valuable ally to the tamer, with it’s poisonous bite and tough exoskeleton, but they are also quite the attraction at sporting events. In a group, the glowing letters on their backs can be used to spell out a favorite team name or the fans’ favorite rallying slogan. Oh, virtue armor, you can’t wait to assist. You give me 70 in every resist. because you sparkle for me when I put you on. and waiting in my pack whenever I’ve died. I save tons of gold on any repairs. and give me away when I sneak around. and as far as quests go, it was the best. And I’d do it again, if I had the chance. Oh, virtue armor, you are awesome. You are warm and personable and somewhat aloof. Your favorite colors are red, yellow, green, orange, blue, purple, and indigo. You are an adventurous free-spirit and prefer to stay at home and read a good book. You occupy your time thinking of all the hobbies that are all out there to do. You become stressed when you do not get your way, and you will never get your way. Not ever. Be first open-minded to the advice of others, then dismiss it out of hand. They don’t know you. Practice what you preach at least 20 percent of the time. Meditate daily at the shrine of choas so that you may find the path to chaotic enlightenment, and look for good bargains whenever you can. As you lay face down in the dirt under a small mob of pixies, you vow to probe further the necromantic arts to divine a reason the fates have conspired to kick you in the gonads. The sound of the fading wingbeats of the returning gargoyle was eclipsed by one that Dupre was far more familiar with as he drew his sword. It shouldn’t take long to reach the camp, regardless of what might lie in his path. The knight turned, glancing around at the voice, before recalling to whom it belonged and looking down. He knelt and sheathed his weapon, blade slick with the oil of the leather wolves he’d slain along the way, and held a hand out for Sherry to alight on. “I thought I had told you it was merely Dupre to you.” His smile was broad under his mustache. The little mouse tittered in his hand as she waggled her whiskers at him. “I never thought I’d see you out here! I thought you returned to Felucca after the battle in Ver Lor Reg?” Dupre stood, and adopted a slightly weary look as he replied. “There were many tasks that had to be taken care of…and they have taken me to many places. I wonder then, if you were not here to see me, if you too are here to see this strange healer?” The camp was just now beginning to come into view and the stark fence rose grimly amidst the landscape. “Yes! I heard him speak but I was driven away by one of the angry gargoyles who thought I was a plague spreader!” Sherry squeaked angrily as they entered the camp. Despite their conversation and the noise of Dupre’s armor, the robed figure before them made no effort to turn or regard them at all. He was evidently hard at work before them, mixing together two of the vials of the cure. Dupre remained silent as he watched the man work, his hands deftly working amidst the vials and beakers and flasks set before him. The manipulation of the chemicals was clearly delicate, and for fear of interrupting him at a crucial step, he allowed him to continue unabated until he set it aside. Slowly, the man turned, his cowl keeping his face covered, and he spoke. Dupre, upon hearing the healer’s voice, reacted in an instant. His stance dropped and the sound of well oiled metal against leather served as his initial response, followed by the shrill squeak of Sherry as she leapt to the ground. The healer quickly held his hands out to his side, showing each with a bag of reagents. Even as Dupre tensed, the healer’s action was to drop both bags upon the ground, and slowly turn to face Dupre, keeping his hands out and empty. “I do so often remember the disparaging way you would speak of me, Sir Dupre, but I hardly imagined you thought me an abomination.” Dupre kept his stance ready as the healer slowly moved his hands up so as not to alarm the alert knight, and pulled back the hood of his shroud to reveal a face that Dupre recognized well. The last time he’d seen this face, though, it had been partially consumed by the clockwork monstrosities of Exodus and with eyes that burned with hatred and resentment. The healer before Dupre looked to him, and the eyes held none of that utter contempt that he had felt in the presence of the thing that lay in Blackthorn’s tomb. Instead, they seemed only intrigued, curious, and if he wasn’t mistaken…just slightly grateful. Still, Dupre wasn’t ready to discount him as a threat. The two were locked in this stalemate for long moments before a small, shrill voice cut through the tension in the air. “Dupre! Let’s try and talk about this first! It’s obvious he’s not the one you think he is!” Sherry rose up on her hind legs as she spoke, her hands clasped in a very realistic approximation of a human’s pleading. Dupre curled his lip, his bushy mustache twitching slightly as a scowl appeared on his face…but he slowly moved out of his stance, and let his sword drift down, until he let the tip rest in the soft blades of grass by his plate-armored feet. Clasping both hands around the hilt, he stood to his full height and stared at the man, never taking his eyes away for even an instant. “It’s obvious he’s exactly who I think he is…but he may not be all that I think he is, either. So talk, Lord Blackthorn. How came you to be in this state?” Lord Blackthorn let his hands slowly come down as he was no longer in any seeming danger, and Dupre’s scowl deepened as a gleam of amusement entered into Lord Blackthorn’s eyes. “And what might that be, Blackthorn?” Dupre kept his gazed fixed. Lord Blackthorn’s face lit up slyly with a grin. “I know you are particular to discussions being had with a drink, but I would much prefer it if we do it over a game of chess. If you’ll just step inside, I happen to have a board with me…” He gestured for Sherry and Sir Dupre to join him, and together they headed towards the small buildings dotting the encampment. Infected gargoyles will no longer spawn. The raiders will no longer spawn in Ilshenar and/or Malas. Players should no longer be teleported into invalid locations when answering the Call to Arms. Players should no longer be ejected from the Despise boss encounter if they enter specific regions of Despise Level 4. Negative karma inhabitants of Despise will no longer aggress onto negative karma players, however they will still fight back if attacked. There should now be a leash on their wisp lieutenants. There should now be a 5 minutes notification before the Doom Spell is casted. Players will now be given 5 minutes to loot and will no longer be teleported back to their base immediately after the encounter. If a players possessed minion is conscripted more than 1 minute after Call to Arms is answered, they will not be transported to the battlefield and will need to wait until the next Call to Arms is called. Conscriptions will only be accepted for one minute after the Call to Arms. If you conscript after a Call to Arms is answered, then you will have to wait until the next Call to Arms. When players fail to slay Andros or Adrian the Doom Spell will now be cast properly. Europa has been busy. For weeks we have grown a team of Treasure Hunters that are now ready to challenge you, Legends, and your team to a race of seven dangerous chests. 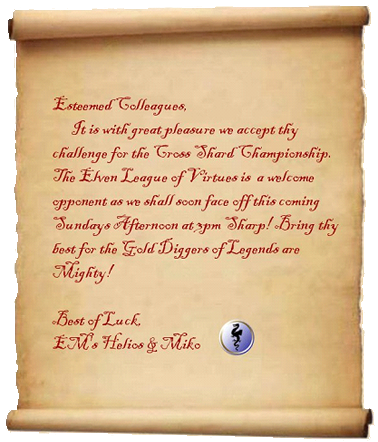 The Elven League of Virtues team from Europa is primed and raring to go… But do you accept? Will this group of Virtuous Elves be able to succeed where many have failed? Or will the Gold Diggers prove once again that they are in a League of their own? Find out as these two teams meet on the sparkling island of Nujel’m for the latest match in the Cross Shard Treasure Hunt Challenge! Moongates will be provided from the New Haven bank. Come cheer on your favorite team! We have just added 3 fantastic items to the Origin store. This is an improved advanced character token, gives you 5 skills at 90 points (no templates) and 225 stat points.